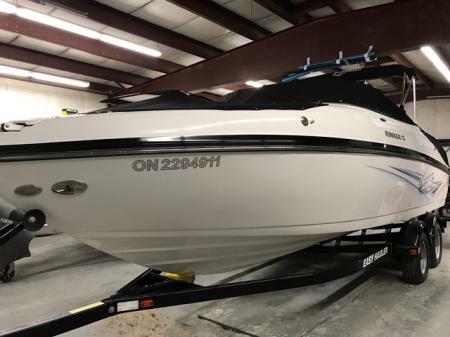 2010 Rinker 246 Bow Rider Captiva, powered with a Merc 350 Mag 300 HP and Bravo three duo prop drive, large extended swim platform, transom shower, large sun pad, wet bar in cockpit, enclosed head, CD stereo with Amp., snap in carpets, tonneau cover, bimini top, bolster style seating, front and rear boarding ladders, dual batteries with switch, pop up cleats, docking lights. Includes matching tandem axle trailer with surge brakes. Only 325 hours and priced at just $44,900. Call 519 636-5229 for additional information.